Immunogen: Native rat HO-2 protein, isolated from rat testes. 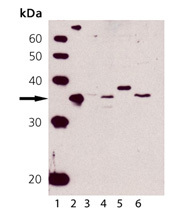 Application Notes: Detects a band of ~36kDa by Western blot. Scientific Background: Heme Oxygenase-1 (HO-1) also known as Hsp32, is the inducible isoform of heme oxygenase that catalyzes the NADPH, oxygen, and cytochrome P450 reductase dependent oxidation of heme to carbon monoxide, ferrous iron and biliverdin which is rapidly reduced to bilirubin. These products of the HO reaction have important physiological effects: carbon monoxide is a potent vasodilator and has been implicated to be a physiological regulator of cGMP and vascular tone; biliverdin and its product bilirubin are potent antioxidants; "free" iron increases oxidative stress and regulates the expression of many mRNAs (e.g., DCT-1, ferritin and transferring receptor) by affecting the conformation of iron regulatory protein (IRP)-1 and its binding to iron regulatory elements (IREs) in the 5'- or 3'- UTRs of the mRNAs. To date, three identified heme oxygenase isoforms are part of the HO system that catalyze heme into biliverdin and carbon monoxide. These are inducible HO-1 or Hsp32, constitutive HO-2 that is abundant in the brain and testis, and HO-3 which is related to HO-2 but is the product of a different gene. The HO system is the rate-limiting step in heme degradation and HO activity decreases the levels of heme which is a well known potent catalyst of lipid peroxidation and oxygen radical formation. Immunohistochemistry analysis of frozen human prostate section stained using HO-2 pAb. Immunohistochemistry analysis of frozen mouse spinal cord section (stressed) stained using HO-2 pAb.